This page is for the DanceDanceRevolution UNIVERSE3 song titled Alice. For the DanceDanceRevolution character of the same name, please see ALICE. Alice's unusual bassline is actually the result of feedback created by a broken distortion pedal. 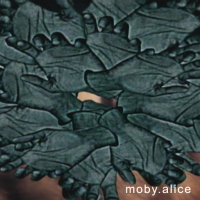 Although the effect wasn't intentional, Moby liked it so much that he kept it as-is in the finished track. The line "having tea with Alice and rabbit" alludes to the novel Alice's Adventures in Wonderland by Lewis Carroll. Alice is one of the four licensed songs from DanceDanceRevolution UNIVERSE3 still present in 熱舞革命宇宙3 中文曲特别版, alongside Bad Taste, Gutterpunk, and parade.